Do you want to double your client base? Hello, my name is Tom Koster and I am a sales trainer and business coach. 1: Is it a struggle for you to attract new clients? 2: Are you really good at what you do; however, haven't mastered that "sales & marketing thing" yet? 3: Are you noticing that potential clients are slipping through your fingers? 4: Are your clients not referring enough other clients? 5: Do you wish new clients were calling YOU as opposed to you chasing THEM? I work with somewhat successful self-employed professionals and very small businesses in Digital Marketing, IT and Web, who struggle to market their business effectively and need to attract a lot of new clients consistently, without pushing so hard. What separates my service from other business coaches is that I specialize in sales and I ONLY work with self-employed businesses in Digital Marketing, IT and Web. Because of this, my clients receive proven, tested, and extremely specific step-by-step information on exactly what they need to do to double their client base. As a result, those who coach with me get more clients, in record time, and make more money than they would on their own. Would you like to double your client base in record time? Visit http://tomkoster.mykajabi.com and take me up on my € 5,60 30 day offer. After you have signed up, we will set up a time to talk and see how I can best help you to double your client base in record time. Of CRN Deluxe, combined with CRN Office hours. After your first 3 months you choose what to do next. 1: You downgrade to the 18 months free "Welcome" membership. 2: You continue the conversation with CRN Deluxe or one of our other programs, based on how slow or fast you want to develop you sales and marketing skills to help you grow your business. This level depends on where you are in your business right now, and where you want to go. Also it depends on your business experience and speed on which you intent to grow. It is advisable to talk to Tom or one of his staff to find out what works best for you in your unique situation. 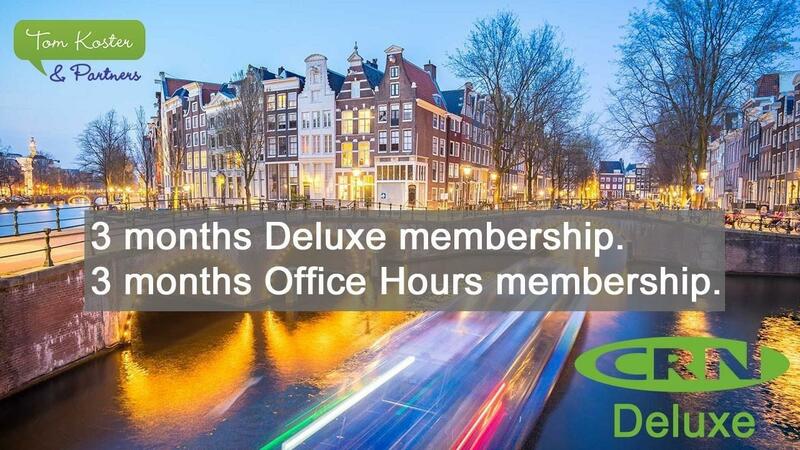 3 months access to CRN Deluxe product and group coaching. 3 months CRN Office Hours - bi weekly Q & A webinar with Tom Koster. Free sales and marketing roadmap.